This July, don't miss the opportunity to relive Josh's intimate February 4th performance from The Allen Room at Lincoln Center. 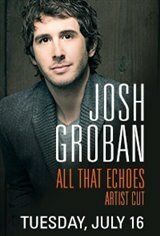 In addition to performing hits from his 12-year career and premiering selections from his latest album, All That Echoes, Josh provided unparalleled access to his fans when he candidly answered questions from audiences in movie theaters across the country. In addition to the concert and the Q&A, this artist cut event will include a special welcome from Josh himself and an exclusive behind-the-scenes look of the making of All That Echoes.